One of the original trinity of Sovereign City Heroes, creator Tommy Hancock proudly presents THE ADVENTURES OF DOC DAYE: DEATH MEANS LITTLE - BOOK ONE as the first in this exciting new Pro Se Single Shot Signature series. Sovereign City is home to many heroes and villains, many geniuses and madmen, many wonderful and monstrous beings. Perhaps Sovereign’s best known resident, considered by many to be the sparkling example of humanity, is Doctor Tempus Daye. 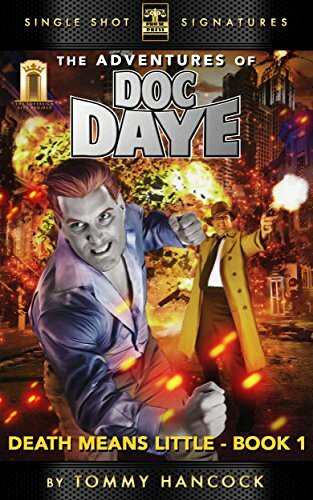 An expert in a myriad of fields and at the pinnacle of near human perfection, Doc Daye carries on a battle against evil and injustice around the world from the heart of Sovereign City. Considered by many to be superhuman, Doc works with a team spread far and wide to carry out his pantheon of good works because, as godlike as many believe him to be, Doc’s achievements and abilities come at a price-one that forces him to stay as far away from the emotions of others as possible, a task he never ever quite masters. When one of Sovereign’s wealthiest men fights like mad to get to Daye Tower and demands to see its owner, it’s just another normal day for Doc Daye. Until that same man literally falls apart in the lobby. Thomas Pariah, Doc Daye’s number one assistant and all around leg man finds himself in the midst of horrific sudden death as he tries to figure out the literal bloody mess around him. And then there’s what came in the mail that day- A dead body, that of a man the size of a doll! and for most digital formats via Smashwords at https://www.smashwords.com/books/view/699383. THE ADVENTURES OF DOC DAYE: DEATH MEANS LITTLE will be a monthly series from Pro Se Productions!